For the casual observer it is safe to assume that all types of tea are produced from a common source material, the leaves of the camellia sinensis plant family – although there are some minor variations to this if my understanding of current taxonomy beliefs is correct. The differences experienced between tea types being due to the either the standard of leaf harvesting or processing methods. Teas are most often classified into 6 broad types: Green, Black, Oolong, Yellow and Dark. Probably the most significant difference between types is the degree to which leaves are allowed to oxidise during processing (as this is where the greatest chemical changes occur), but it does not tell the whole story. In simple ‘elevator pitch’ terms (but not necessarily technically correct) green tea is un-oxidised, oolong tea is semi-oxidised and black tea is fully oxidised. White, dark and yellow teas can be regarded as variations or extensions of these three types. There are some who have very fixed views on whether individual teas belong to a particular category type or not often based on their own prejudice or expectations. There are most definitely overlaps at the boundaries between each type. Personally, I see it more as a guide to what you might expect and have never come across any prescriptive rules stating that a particular tea must be processed in a particular way. I look at it in the same way as a movie being assigned to a specific genre. If you went to see an Action movie and it had a touch of Romance then who cares. But if you went to see a Sci-Fi and it turned out to be a Musical then something has gone very wrong. I believe it is best to remain open-minded provided there is not an intention to misrepresent or mislead. A tea should be judged on your overall experience rather than in comparison to a checklist of features. Before continuing we will pause to consider some of the terminology used in tea circles, specifically in relation to ‘oxidation’. Oxidation is a chemical reaction that occurs when harvested leaves come into contact with oxygen. The more of the leaf structure that is exposed to oxygen the greater the degree of oxidation. Oxidation can be prevented or stopped by heating the leaves at the desired time; a process known as kill-green, firing or denaturing. In the early days of tea processing it was believed that this process was, in fact, fermentation and even now the words ‘oxidation’ and ‘fermentation’ are used interchangeably. To add more confusion is the fact that a more accurate description of the process should be ‘enzymatic browning’ rather than oxidation but as oxidation is the most commonly understood I will continue to use it here. Green Tea (genre: Drama) – a short physical wither after which leaves are fired within a few hours of harvesting to deactivate the enzymes that cause oxidation and the chemical changes that this produces. Firing can take the form of steaming, baking or frying. The leaves are then generally rolled and dried but maintain much of their green colour. Tea flavours are typically grassy, vegetal or floral. Black Tea (genre: Action) – subject to a prolonged controlled physical and chemical wither prior to a hard rolling (maceration) that breaks down the leaf cell walls to facilitate oxidation. Once oxidation is complete the tea is dried, graded and sorted. Black teas are often brisk, full bodied with flavours tending typically towards malty and chocolate. In China, black tea is referred to as red tea which is a better approximation to the colour of the brewed tea. Oolong Tea (genre: Adventure) – undergo physical and chemical withering before being shaken/ bruised at the edges to promote oxidation. The degree of oxidation in Oolongs can vary greatly and are typically quoted as being between 20% – 80%, which is often an estimate in any case. The complexity and variety of flavours in Oolongs is vast and is further developed by the practice of roasting or ageing the finished tea. White Tea (genre: Romance) – mainly just withered and dried although it is sometimes lightly rolled for shape. Usually described as minimally processed, this is only true in terms of process steps rather than the time and degree of attention required. Oxidation occurs during extended wither but is controlled through drying rather than firing. Frequently but not always made from leaf buds only while the inclusion of young leaves delivers stronger flavour. Yellow Tea (genre Sci-Fi) – a variation of green tea, yellow tea undergoes an additional step of moist heaping or smothering under cover after firing and before rolling. The resulting tea is more mellow and without the grassy aroma of green tea. It is the least common of tea types. Dark Tea (genre: Epic) – aka post-fermented tea of which the most famous is Pu’erh tea. Dark tea will usually start life as a simple green-like tea but allowed to ferment (microbial ripening) as a post processing activity. A more recent development has seen accelerated ripening employed by heaping fired leaves under covers to promote microbe activity. This is referred to as ‘cooked’ Pu’erh while the more traditional method (i.e. without accelerated ripening) is known as ‘raw’ Pu’erh. Earthy and woody flavours are typically associated with post-fermented teas. Flavoured Tea (genre: Musical) – not really a type of tea but an increasing trend is flavoured teas. Tea leaves have a great capacity for absorbing flavour and there are a wide range of available, from the more traditional floral scents (e.g. jasmine) to more exotic and contemporary flavours. Many purists turn up their noses at scented teas but they can be delightful. The majority of modern flavoured teas, however, are artificially scented. 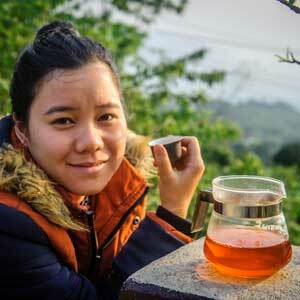 Here in Vietnam all types of tea are produced albeit in different quantities and qualities. The exception is any yellow tea as described above although you will come across those who say they are making trà vàng (literally yellow tea), particularly in the wild tea growing areas. This, though, is a very basic green tea (no smothering involved) that frequently goes across the border to China for further processing as dark tea. Oolong tea production is a more recent phenomenon in Vietnam often in collaboration with Taiwanese businesses while dark tea production has long been undertaken but is having something of a renaissance due to increased worldwide interest. 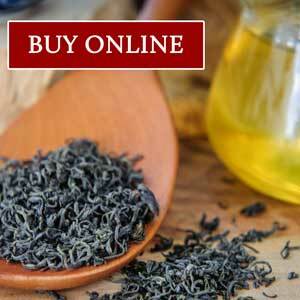 Jasmine and lotus teas from Vietnam have become quite well known in overseas markets.